The oil price is set to skyrocket, provided things keep going the way they are. 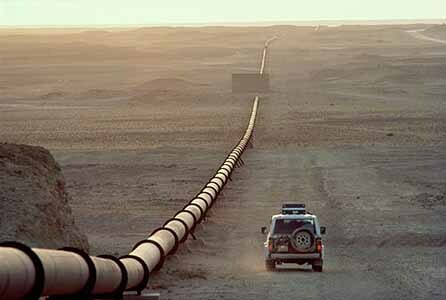 In particular, the situation in Egypt where the government is cracking down on civilians and even shutting down all communications including internet and phone services means that there is a possibility that oil production from the region may become unstable along with transport through the Suez Canal. Add onto this the ever increasing demand in the east coupled with the finite reserves, unless a great new energy technology is discovered relatively soon oil will soon become a luxury resource. 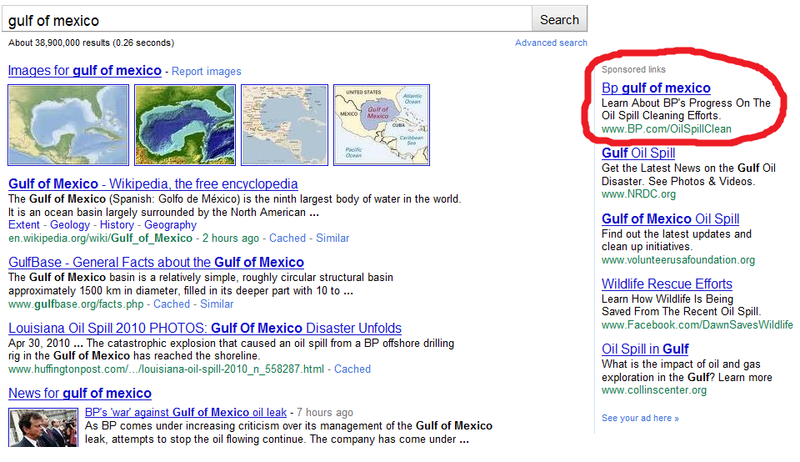 BP is spending millions of dollars as of late in advertising it’s oil spill response to the world (see examples below). 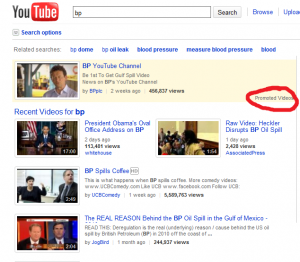 You’ve probably already seen an ad on Google search, YouTube, and even Facebook! 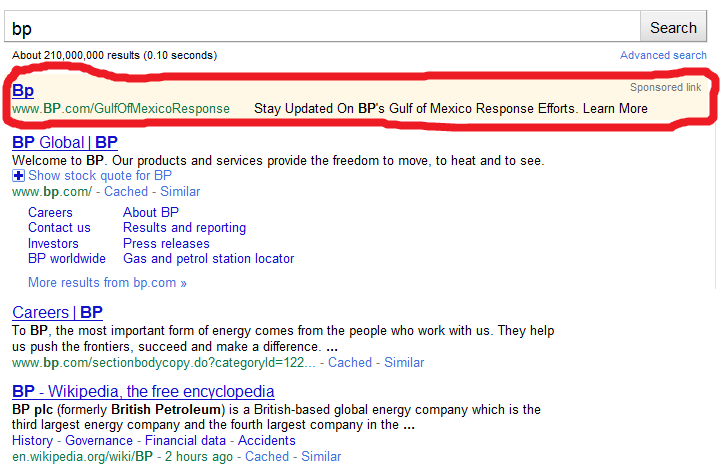 What few people know is that generally speaking, each ad that is clicked corresponds to a few dollars of money BP is spending just so you will view their one-sided opinion on their involvement/ responsibility for the crisis and an overblown picture of how they are helping people out. 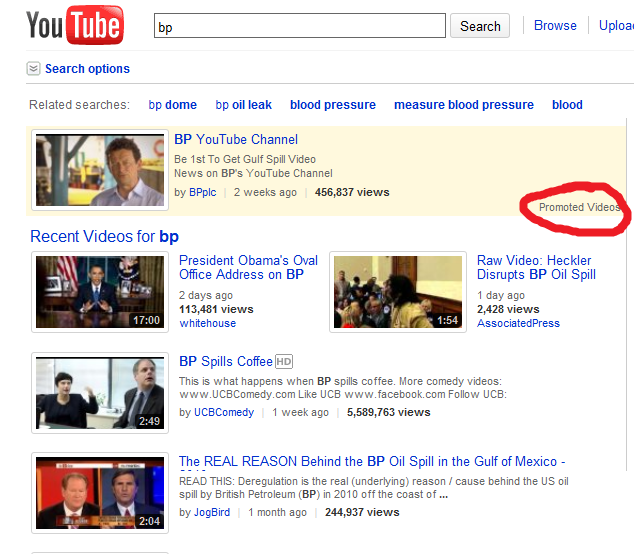 My suggestion to BP is the following: Cease the advertising, we’ve seen you enough on television already. Stop trying to play us like fools, hiring hundreds of temporary workers for Obama’s visit to the gulf and dismissing them just hours after he leaves for good. Do not belittle our people or underestimate our intelligence, and most of all stop the oil from leaking and pay back in full all those who you have hurt or destroyed through your reckless actions over the years of your existence. Do not try to pull another stupid trick such as dumping oil dispersants into the gulf – making the oil cleanup impossible while spreading toxic oil and dispersant miles underwater where it can do it’s damage to another realm of the aquatic ecosystem (increasing toxic hydrocarbon levels in fish and destroying their eggs). Yes, we can’t see it on the top of the gulf with a satellite but we know its there and underwater readings after their use indicate a larger oil concentration than if the oil naturally floats to the top. Just recently Representative Joe Barton gave a heartfelt apology to BP for the US government’s treatment of the company after the worst environmental disaster of the century. He made sure to remind his campaign contributors (oil companies have legally financed Mr. Barton’s campaigns over the years for $1,400,000) that he was still on their side, and still going to fight for the ones with deep pockets instead of the common man being choked to death by the killing force of toxic waste being spread around a large portion of our country’s coastline. Watching the video below you will find a man who is totally and utterly delusional and loyal not to his country but his pockets and those of his oil producing buddies. Historically speaking, this is not the case – BP has a history of devious and underhanded behaviour that extended beyond ignorance and into actively subverting safety checks and regulations to safe money, and historically paying off whatever repercussions these careless behaviors. Examples included a 200,000 gallon oil spill in Alaska’s north shore due to pipes out of maintenance , a Texas refinery explosion that killed 15 and last year a fine for not improving the safety standards of that very same plant. Worst of all, there are a multitude of former employees who say BP discouraged them from accurately reporting on inspection reports in order to save money using older equipment. Who knows whether this is an industry-wide phenomenon, if so then shame on all of them and let this be a major lesson in how mitigating a disaster starts with preventative action. Punitive damages are capped for corporations, while punitive policies proliferate for citizens. This tears the social contract apart, and the only way to repair it is to apply the same principles of accountability up and down the social hierarchy. We should start with BP. 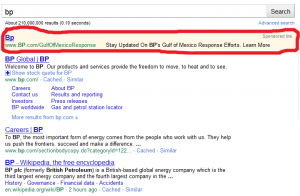 Shall BP Pollute the Air or Water with Excess Oil? BP is planning on burning 10,000 barrels of oil per day with a second ship on it’s way to the extraction zone to tap into the underwater geyser. This will keep the same amount of oil from spreading in the ocean, and in the process create a huge plume of air pollution in the Gulf that will suffocate and intoxicate workers’ lungs for miles around. Of course this is the cheapest solution to the logistics problem of processing the excess oil, and has tentatively been approved by the coast guard (the organization largely in charge of managing the government’s interaction with the oil company). Already 90,000 barrels of oil have been burned since the Deepwater Horizon exploded on April 20, 2010, and BP’s future plan is to cut down on the burning as processing capacity increases. Oil, the fuel for automobiles, boats, power plants, etc. has recently encountered a major hit to its price. This may or may not be caused by the oil spill in the gulf or the heavier restrictions the US government is planning on making on oil companies. This event could also have been a result of a weaker economy, Greek and Spanish troubles etc. However, in the grand scheme of things this recent buildup in stockpiles and decrease in price may prove to be a great time to invest heavily into oil futures or even doubling down into double-long oil ETFs. Currently the price of oil futures is $73.69, up today 1.53% after favorable US housing data came out. My estimate is that oil will reach $90 by the end of this year, meaning a 44% increase for the double-longs or 22% for the simple long position. 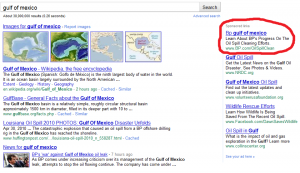 The gulf oil spill will only help the price of oil, as it is restricting US off-sea drilling. The only scenario in which oil will further decline is if the economies of the world, chiefly China and the US, slow down. While it is still the most economical way to fuel our energy needs as humans, fossil fuels especially crude oil is witnessing it’s peak production days. The Hubbert peak theory, which proved very accurate when applied to both US and Norwegian oil discovery and production rates, predicted that the world would reach peak production almost ten years ago. He also added a caveat which stated that if OPEC purposefully lowered it’s production, which it has done in the past, that peak production could be extended to around ten years later. Well, in a few months it will have been exactly ten years later, and thanks to technologies such as Google Earth, we now know that Saudi Arabia is in its last throes of full production capacity. While fresh oil wells do not need water to be injected to extract oil, a secondary oil recovery method indicates that Saudi Arabia is nearing it’s peak production. Water, which is very scarce in Saudi Arabia, costs relatively little as much of the water is subsidized by the government and the Saudi government puts around 2 billion USD per year into water and irrigation. This amounts to around $80 USD per person per year in the country. Saudi Arabia drills for water just like it drills for oil, as much of it’s water supply is from non-renewable groundwater from the deep aquifers. Pictured above is a form of secondary recovery, basically flooding the oil well around the extraction point forcing the oil to the middle. Pictured below are some Saudi farms courtesy of satellite images from Google Earth. While the US witnessed it’s peak oil in the 1970’s, it wouldn’t be too far fetched to anticipate world peak oil along with Saudi Peak oil in the next few years. World oil consumption has been given much attention over the last thirty years, yet world water consumption has been following the same trend and has quadrupled in the last 50 years just like oil. Unlike oil, water is a renewable resource and returns every year in the form of precipitation. However, along with global warming the world’s glacier sizes are getting visibility smaller, forcing many countries to buy water from other countries. A 2006 study has predicted that the Alps glaciers will be gone by 2050 and on average about 3 percent of Alpine glacial ice is lost each year. Chacaltaya, a mountain range in Bolivia which boasted a glacier for 18,000 years, has since early 2009 been barren. Below is a photo of the mountain in 2002. It is hard to doubt with these concrete pieces of evidence that the sources of easily obtained fresh water are fast disappearing. 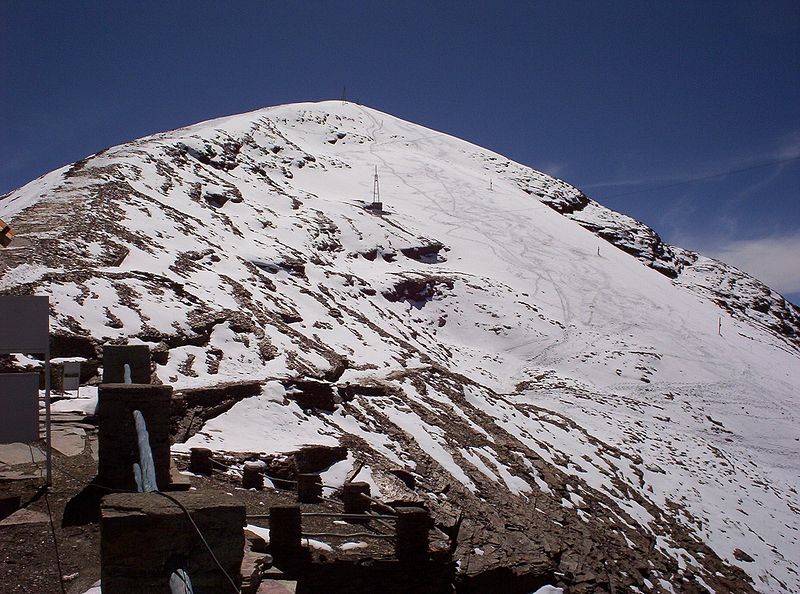 Chacaltaya, which had undergone a 80% reduction in size from 1987 to 2007, used to be Bolivia’s only skiing resort. Now Bolivia has none. Once oil is gone, much of the world will resort to burning coal for its energy needs, if left unchecked the soot and carbon emitted by these power plants will further harm the planet and its water resources. Commercial considerations were the driving force behind the ‘deal’ to free terrorist bomber Abdelbaset Ali Mohmed al-Megrahi, leaked papers from Jack Straw, the justice secretary, to Kenny MacAskill, his counterpart in Scotland who took the stance to make and defend the decision. These leaks will most likely infuriate those who were already disgusted with the move, and probably invoke retaliatory responses from the United States, who lost the most citizens on flight Pan Am 103. A sad and chilling reality, as one of the world’s worst muderers is released on “compassionate grounds” and business deals with Libya begin, with BP standing to gain the most from these lucrative oil deals. 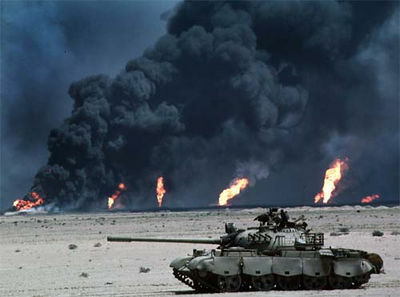 When Nazi Germany first planned it’s war, It knew that it had no stable oil reserves. It is for that reason that they developed an efficient way to convert coal into oil. The technology was even advanced enough capture the pollution caused by doing it! After WWII, Americans captured the technology, but have scattered the documents across the nation. In 1977 American scientists recompiled the Nazi documents. Converting coal to oil itself produces pollution, and combine that with burning the oil itself, and it’s pretty obvious that “Nazi oil” is more polluting that regular oil.